AMAC Aerospace is proud to announce that Airbus Corporate Jets has appointed AMAC’s facility in Basel, Switzerland as an approved Completion Center for the ACJ350 XWB. As the latest addition to the Airbus family of VIP widebodies, the ACJ350 XWB offers innovative technology and enables the most efficient and cost-effective flight possible, with “nonstop to the world” range in a typical configuration for 25 passengers. With this Completion Approval, AMAC Aerospace’s completion facility in Basel, Switzerland is now authorized by Airbus to provide its completion services, expertise and know-how to ACJ350 XWB operators and owners. As one of the largest privately-owned facilities in the world offering maintenance and completion services, AMAC Aerospace has returned to service over 20 VIP and VVIP completion and refurbishment projects since the first hangar was built 10 years ago. With AMAC Aerospace’s Design, Production and Maintenance Organization Approvals in conjunction with its in-house capabilities the MRO and Completion Center offers a one-stop shop for all enquiries. “AMAC Aerospace has established an excellent working relationship with Airbus over the years and we are honored to be appointed an Approved Completion Center for the ACJ350 XWB. Further to this we look forward to welcome the first ACJ350 XWB operator or owner at our facility in Basel to demonstrate our capabilities when it comes to cabin outfitting” said Mr. Bernd Schramm, Group Chief Operating Officer, AMAC Aerospace. 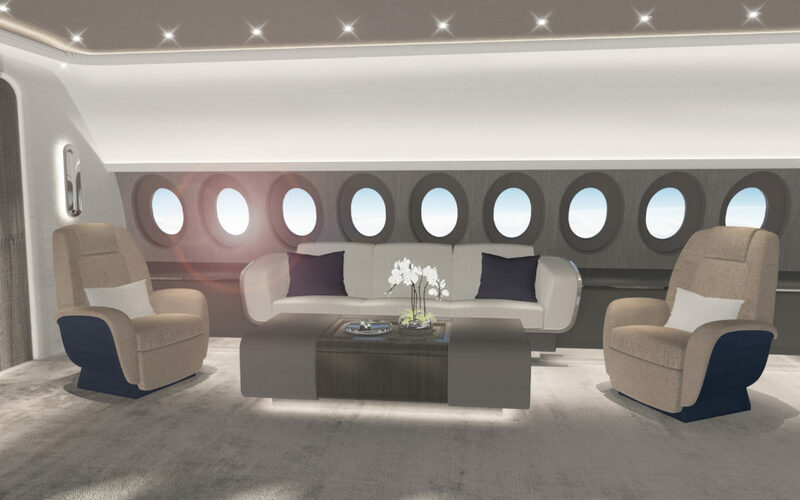 Renderings for an ACJ350 XWB cabin outfitting from the design studio ‘Pegasus Design’ “A bold, sophisticated interior showcasing a relaxed layout, characterised by a mixture of unique finishes, bespoke design and effortless style intrinsic to the DNA of Pegasus Design.” said Peder Thaulow Eidsgaard, Pegasus Design.